I have mixed feelings about set lunch specials at Michelin restaurants. They can be very good value, but as they often offer a limited selection, they are not necessarily a complete representation of what a restaurant has to offer. However, browsing through Quilon’s lunchtime menu online, I was pleasantly surprised to discover the number of choices available. 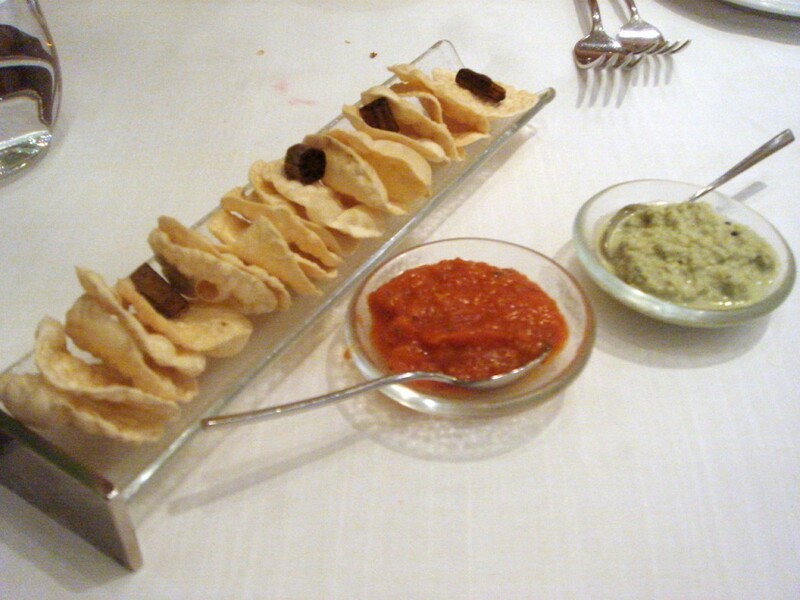 Quilon is a one Michelin-starred restaurant which specialises in South Indian Coastal cuisine. It opened in 1999, earning its first Michelin star in 2008. The lunchtime menu listed about 6 starters, 4 seafood dishes, 3-4 game and meat dishes, not to mention various accompaniments and vegetable dishes. Three courses and a side such as rice or bread costs a very reasonable £22 per head. A combination of price and choice lured me into a visit to Quilon. For our initial little tasters, we were presented with tiny bite sized pieces of crispy, light poppadoms with coconut and tomato chutneys, both of which were nicely spiced. 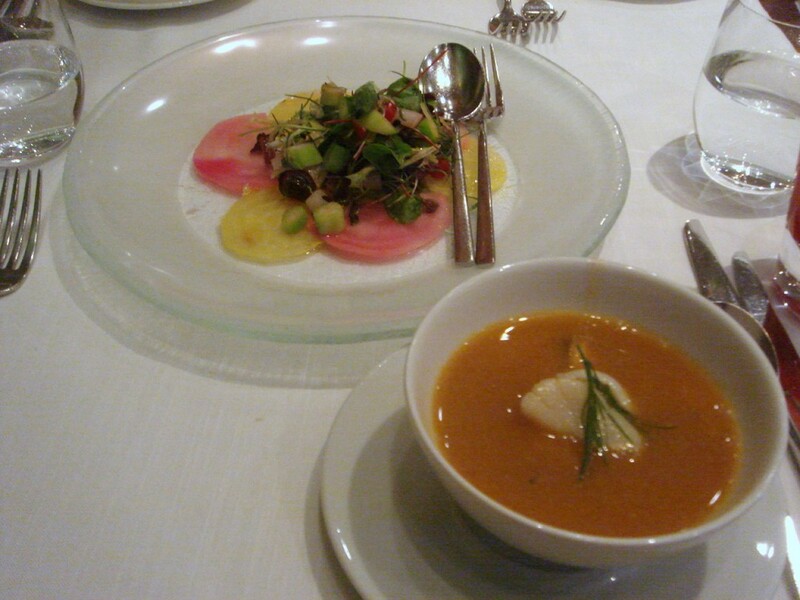 Our first starter was a seafood coriander broth which yielded a delicate seafood flavour. There was a decent supply of mixed seafood including prawns, squid, mussels and fish, but while it was pleasant, it was unspectacular. A Quilon salad was refreshing and light. Consisting of a mixture of greens including asparagus, candied beets and tiny baby tomatoes, it tantalised with a delicate lavender flavour and a kokum (a small round Indian fruit) infusion. 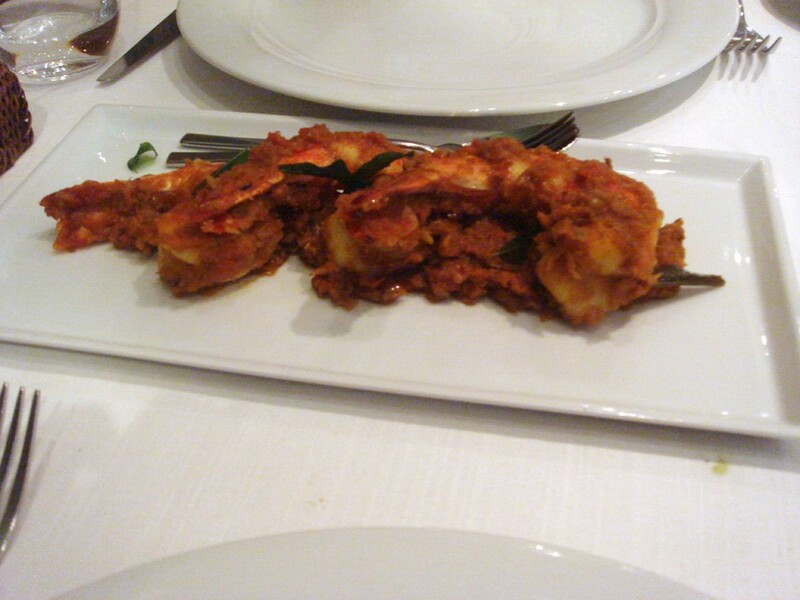 To mains, and three jumbo sized pieces of tiger prawns impressed in a prawn masala (£6.50 supplement). The prawns were firm and flavoursome, and the masala yielded a lovely balance of tomato and sweet onion flavour. A curry preparation of pistachio lamb, slow cooked with freshly ground pistachio, chilli and spices, was thick and creamy. Disappointingly, it was a little light on pistachio flavour, but there was a fiery aftertaste of chilli heat which lingered on the palate afterwards that I rather enjoyed. The lamb was nice and tender, although I found the portion size a little small. 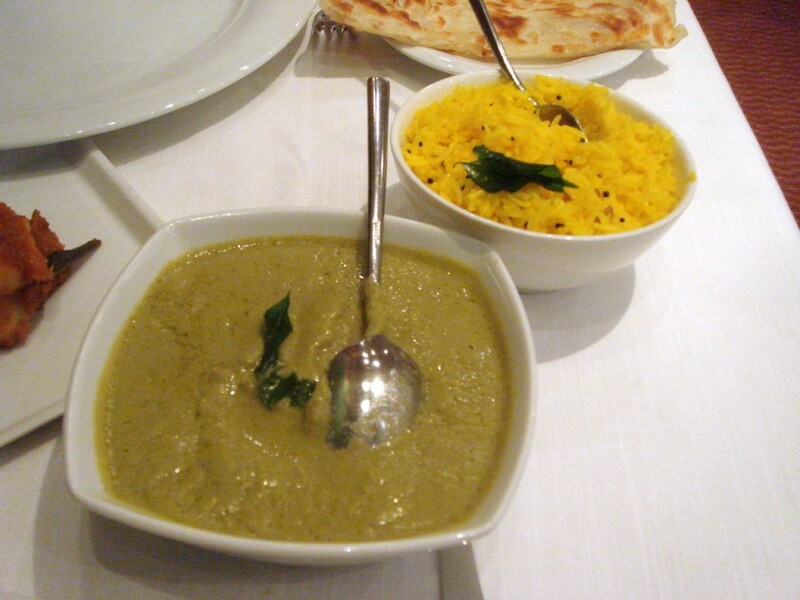 To accompany our mains we chose lemon rice and malabar paratha. The rice had been tossed in lime juice, curry leaves, split Bengal gram (a lentil) and pure ghee to create a delicate zesty flavour. The malabar paratha was wonderful. It’s light and airy texture exuded grace and skill in its preparation. 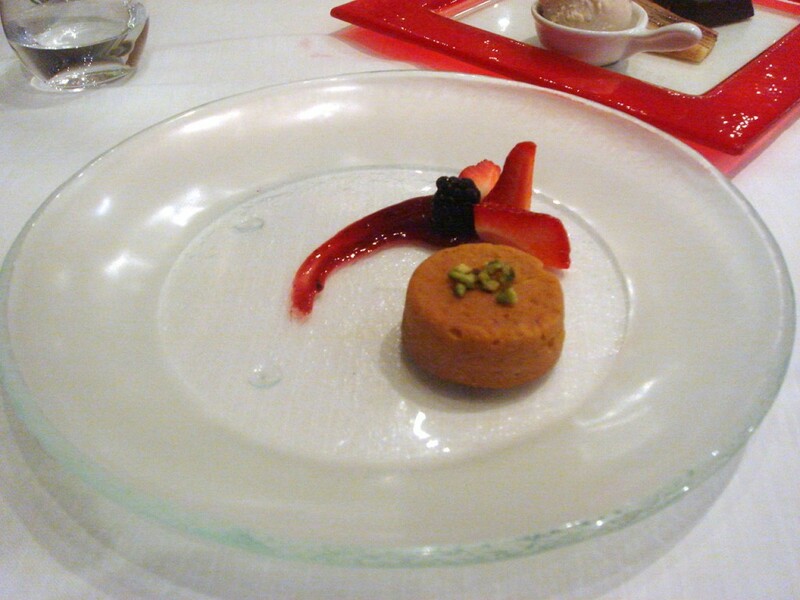 Our first dessert was a dish of bibinca and dodhol, a Goan dessert with Portugese origins. Bibinca is a type of layered cake, with each layer being baked separately before being put together. It’s made using coconut cream, egg yolk, nutmeg, flour and sugar, and in the Quilon version, chocolate sauce was added between each of the layers to give this wonderful cake a delectable richness and to also provide a contrast to the subtle flavour of the coconut. 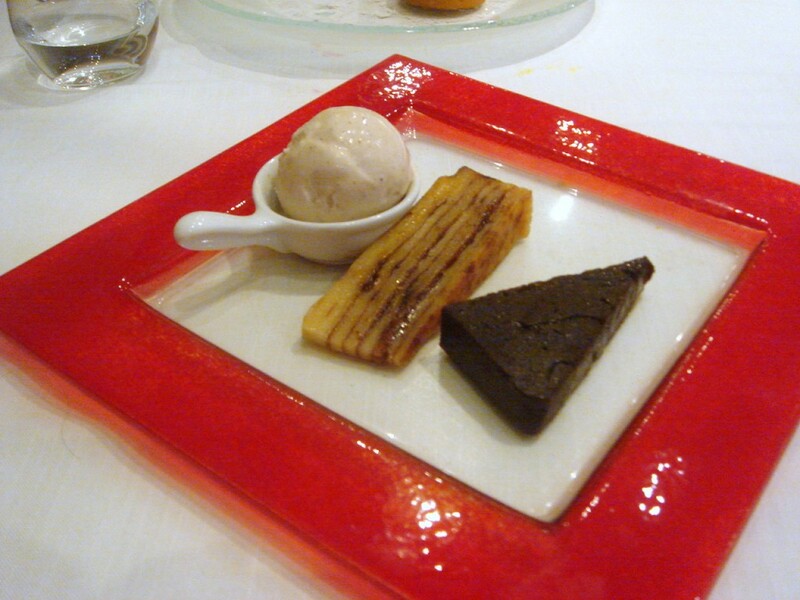 Dodhol is a pudding made from palm jaggery, an ingredient that comes from the root of sugar cane. Slightly stodgy in texture, the dodhol also contained cashew nuts which gave it a lovely caramelised nutty flavour. This dessert was accompanied by vanilla ice cream. A jackfruit pudding tasted more like a cardamom than a jackfruit pudding, but was tasty nonetheless. It had a dense texture, and the accompanying berry coulis helped to provide acidity to the dessert. The décor, with its mustard coloured seating and pinewood flooring, has the look of a business hotel brasserie. This is unsurprising as the restaurant is situated in the Crowne Plaza Hotel building. But decoration scheme aside, this was a lovely meal with some decent spicing and flavours. Service was polished and attentive, and at £22 a head (and a 10% rather than a 12.5% cover charge) it was one of the better value Michelin lunch menus that I have ever had in London. The dinner menu at Quilon looks similar to the set lunch one, so in this instance, lunch does mean you get a good taste of what dinner might be like. However, dinner will set you back about double the price (the restaurant tells me that it typically costs about £45). Lunch tasted really good at £22, and I would enjoy going to Quilon again. But I’m not convinced that I would be tempted to go at dinner time (especially given the dour setting) when I know I can pay half the price for lunch. Quilon is open for lunch Monday to Friday and Sundays. Price range: Lunch is £22 per head. Dinner is about £45 per head. Excludes drinks and service.